Bank stocks are the worst. Here’s why. It's been a tough decade for bank stocks, leaving a lot of investors, including me, disappointed with the whole industry. As we approach the 10-year anniversary of the industry's pre-crisis high-water mark, I decided to undertake the cathartic exercise you see here, lamenting my 12 reasons investors should hate bank stocks. In 2015, Citigroup (NYSE:C) reported full-year net income of $17.2 billion according to generally accepted accounting practices. However, adjusting for the attributions of noncontrolling interests, Citigroup's comprehensive net income was $11.1 billion. However, again, the company's taxable net income was $20.4 billion for the year, based on its $6.1 billion in income taxes and stated 30% effective tax rate. So how much net income did Citigroup, or any other bank for that matter, actually earn in a given period of time? The truth is that no one really knows. The answer depends on which accounting rules you use, how management decided to value the trillions of dollars of assets and liabilities on its balance sheet, and which number you choose to believe to be most accurate within a certain margin of error. Citi's total assets were $1.7 trillion at year end. What's a reasonable margin of error for an entity with that much stuff on its book? Your guess is as good as mine, and I hate that about bank stocks. If you think a bank's income statement is hard to pin down, then you're going to really hate its balance sheet. Take JPMorgan Chase (NYSE:JPM), for example. At the end of the second quarter, JPMorgan reported total assets of $2.47 trillion, total liabilities of $2.2 trillion, and total equity of $252 billion. That's all straightforward enough, even if it's the only time you'll have to consider a trillion of anything this week. However, when you go one level deeper, things get murky. Very murky. There's the $216 billion in "trading assets -- debt instruments," the $102 billion in "securities borrowed," and $192 billion in "all other noninterest-earning assets." Then there's the $123 billion in combined derivatives exposure -- or at least the derivatives exposure explicitly labeled as such. The off-balance-sheet risks are even harder to find and even more impossible to figure out. This is a good place to pause for a moment and reflect. Remember that we're talking about billions and trillions of dollars of things -- contracts, mostly -- neatly labeled and presented in such generic terms that it's really easy to just gloss over. With a team of several hundred accountants and several months to work on it, you could probably figure out what all these neatly labeled accounts actually represent. Short of that, I'm not sure it's possible. Bank accounting, in general, is miserable. The alphabet soup of abbreviations alone is enough to make even the most seasoned accountant walk out on the job. There's HQLA (high-quality liquid assets), the CET 1 ratio (not even worth explaining here, much less the other four commonly used capital ratios), DVA/CVA/FVA (debit, credit, and funding valuation adjustments), the SLR (supplementary leverage ratio), and... you get the idea. I could go on. But I won't, because I hate the specialized jargon in bank accounting. My first three reasons to hate bank stocks are all about how hard it is to make sense of their financial statements. No. 4 is much easier to understand, but it may be even scarier: Banks use a ton of leverage. Most banks in today's market have about $10 in assets for every $1 in equity. That means that if the bank's assets lose just 10% of their value, then the bank's entire equity base will be wiped clean out. That's a lot of risk, and I hate that about bank stocks. 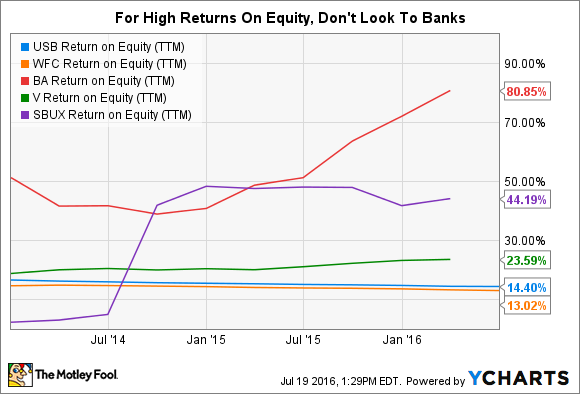 You'd think that with all that leverage, a bank would have no problem posting impressive returns on equity. It turns out that's not exactly the case. According to the most recent data available from the FDIC, the average U.S. bank earned just 8.62% on its equity as of March 31. That's not even enough to cover a bank's theoretical cost of capital, generally considered to be 10%. Even the very best bank stocks, such as U.S. Bancorp (NYSE:USB) or Wells Fargo (NYSE:WFC), leave much to be desired in their returns on equity. Compared with leaders in other industries, even these high performers come up short. When consumers love a company, it makes it that much easier to sell products, open new markets, and build the kind of public-relations buzz that can drive strong investment performance. Unfortunately, banks don't have this advantage. Bank of America (NYSE:BAC) is a great example. In a Zogby poll last year, one in four B of A customers who responded to the survey rated the bank's customer service as poor. That's not good. Last year, a Harris Poll asked over 27,000 people to name their most loved and most hated brands. No bank made it into the 20 most loved brands, as you probably could have guessed. The bottom 20, though, was full of banks, led by Goldman Sachs as the most hated brand in the entire survey. Bank of America was 10th worst, Citigroup was 12th from the bottom, and JPMorgan came in just behind at 14th worst. 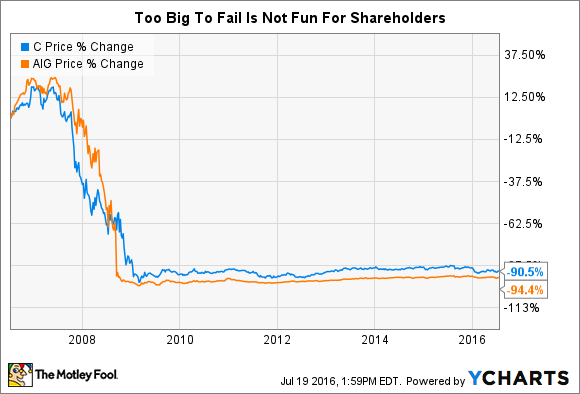 Having a bad reputation doesn't necessarily mean a bank stock is a good or bad investment. But I still hate it that so many consumers dislike their bank. More than any other thing, the financial crisis and Great Recession are what most people point to as the reason why they hate their banks. Banks lent money to borrowers who couldn't afford to repay it. Sometimes those borrowers lacked even the basic financial acumen to understand the terms of the loan. Other times, banks didn't bother verifying a borrower's income, net worth, or creditworthiness. It was, at best, a grossly irresponsible situation. The easy money, alongside a plethora of other factors, fueled the bubble in the real estate market, which we all know nearly brought down the entire global financial system. I hate that this happened, and I hate how the banks of that era failed their customers, their communities, and their shareholders. If the complexity of a single bank's financial statements weren't bad enough, investors also have to deal with the even more complex interconnectedness of the overall financial system. The best and most terrifying example is the failure of Lehman Brothers in 2008. Lehman's failure didn't just harm the company's own shareholders and employees; it catalyzed the panic that froze capital markets, saw the Dow Jones Industrial Average plummet 5,000 points, and even caused the government of Iceland to collapse. The financial world, while better protected than it was in 2008, is still as interconnected as ever. Global regulators require 30 bank holding companies to maintain elevated capital ratios because they are "global systemically important banks." Led by JPMorgan, all four of the U.S. megabanks are on the list. For an investor, buying shares in one bank is, in a way, buying a share in the interconnected web of the global financial system. 9. And I hate that they're "too big to fail"
To the uninitiated, learning that a bank is "too big to fail" may sound like a great thing. If the bank can't fail, then my stock can't either, right? Being too big to fail just means the government won't allow the bank's operations to stop doing business. The lights will stay on, but shareholders will be left outside in the dark. Don't believe me? Just ask investors in Citigroup or American International Group who were around for their bailouts during the crisis. 10. And I really hate "too big to jail"
Too-big-to-fail's cousin, "too big to jail," is another thing I really hate about bank stocks. Over the past 10 years, regulators, legislators, and even the Department of Justice have levied fines, settlements, accusations, and charges against a whole host of banks around the globe. These banks were guilty of misleading borrowers, rigging interest-rate benchmarks, self-dealing, and more illegal activities. Yet there have been no significant legal consequences for the executives responsible for the activities at these banks. Yes, some bank executives lost their jobs and perhaps even their reputations, but more often than not they were able to land softly with huge severance packages while sidestepping personal legal culpability. Consider the 2012 investigation of HSBC (NYSE:HSBC). The bank was caught laundering money for Mexican drug cartels and countries under U.N. sanctions. Under pressure from financial regulators, the Justice Department accepted a $1.2 billion fine, instead of pursing prosecutions of individual bankers. The drug money was laundered in the bank's Mexican business. The executive in charge of that business retired in 2012, collecting 782,000 pounds in pay plus 4.2 million pounds' worth of HSBC stock as part of his bonus plan. I really hate that. Since the financial crisis, new regulations have swamped banks with more changes, rules, reports, and oversight than ever before. There's Dodd-Frank, the Basel Accords, qualified mortgage rules, changes to existing real estate regulations, Federal Reserve stress testing, and more. To be fair, I don't necessarily hate that banks are so highly regulated. Given what we've discussed here, I think many of these regulations are necessary. But as a bank stock investor, I hate that banks are having to devote so many resources into compliance, instead of innovation and investments for future growth. Banks have been around for thousands of years, and for much of that time the business model hasn't really changed. In simple terms, banks collect deposits from customers and then reinvest that cash into higher-yielding loans and debts. Throw in some fee income from other financial services, subtract out the costs to keep the lights on, and whatever is left over is profit. It's pretty simple, and it's worked for ages. Today, though, banks are facing challenges previously unheard of. On one hand, bitcoin and other digital payment technologies are challenging banks in the transaction business. Marketplace lenders such as Lending Club (NYSE:LC) are using the internet to cut banks out of the lending process, giving customers easier access to capital and paying investors much higher yields than a bank ever could. Artificial intelligence and machine learning are also changing the wealth-management business, while foot traffic at bank branches has been declining for years, replaced first with online banking and, more recently, mobile banking. As an investor, would you rather own shares of the company doing the disrupting, or the one being disrupted? Me, too. And I hate that about bank stocks.